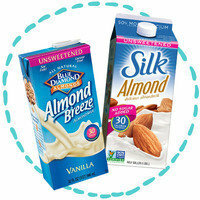 Many of your recipes call for unsweetened almond milk. I don't like the taste of almonds... What can I use instead? Don't confuse this with coconut water or the thick sweet stuff that comes in a can! 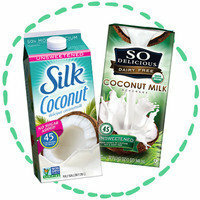 This drink is similar to almond milk -- find it in shelf-stable or refrigerated cartons. It's not quite as versatile as the others, since it has a slight coconut flavor. And it will increase the calories and fat of your recipe by a bit. But it's definitely worth checking out... It's my number-one pick for those with nut allergies. Brand picks: Silk and So Delicious. 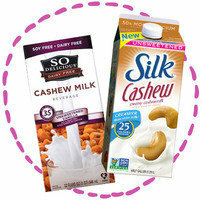 Now we're getting into higher-cal territory, but soymilk has some advantages. It's a supermarket staple (fridge section), and it has more protein -- and often more calcium -- than other nondairy milk options. The flavor isn't quite as mild as the others, but it's nice and creamy. 8th Continent is my brand suggestion. 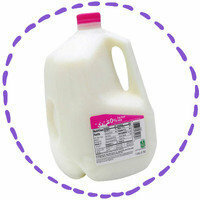 Okay, this one's not a milk swap: It's the real deal! If only dairy will do, stick with the fat-free kind. 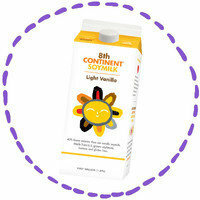 It's a good source of protein and contains a lot of calcium. Using it in place of almond milk will have a fairly significant impact on your recipe's stats, but it's still a solid choice. We use it from time to time in recipes, especially savory ones where we don't want any distracting flavors. You may want to add a few drops of vanilla extract if the recipe calls for vanilla almond milk, though. There you have it... Options galore! Did you know that June is National Steakhouse Month? Celebrate with a petite sirloin and a double order of veggies! Got milk? Make sure your pals have it, too. Click "Send to a Friend" now!